David Draiman is a man who speaks his mind. 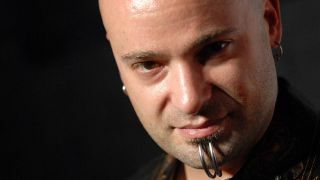 Throughout Disturbed’s career, he’s never been afraid to shy away from confrontation or controversy, whether that’s tackling critics of his ban, addressing hot-button topics such as the Israel/Palestine conflict or even calling out his own fans. At the same time, he’s an unashamed bon viveur – a man who likes the finer things in life, whether that’s wine or women. And while fatherhood hasn’t mellowed his outlook on the world, he does at least have a sense of humour about how the rest of the world sees him. Disturbed emerged from Chicago during the dog days of nu-metal, though they owed little to that movement. But they’re the rare contemporary metal band who have remained consistently successful, weathering passing trends as many of their original peers fell by the wayside. This is in part down to the frontman’s force-of-nature personality, onstage and off. He may rub some people up the wrong way, but you get the feeling that’s exactly how he wants it. Do you have any other brothers of sisters? So brains run in the family then. You triple majored at Loyola University didn’t you? Studies weren’t always foremost in your thoughts though. You were expelled from five boarding schools, were you not? That sounds rather excessive for someone who would already have had a taste of what normal adolescent life should be all about. In what ways did you rebel? What was the worse thing you ever did? That sounds like the kind of hi-jinks a lot of normal teenage boys get up to. Music must have been something of a release for that rebellious streak in you? How did all this affect your relationship with your you had with your parents? Yet for all the rebellion, you were a good student who achieved things academically. You were on the verge of joining law school and you used your Business Administration degree to run Health Care centres before you joined Disturbed. As someone who clearly enjoyed the more colourful things in life, Disturbed must have offered you even greater opportunities to, well, give in to hedonism. Have you ever heard the rumour that you were an agent for Mossad? Despite not taking a religious path, you still seem resolutely proud of your Jewish heritage.